This week War on Want is supporting heartunions, the TUC’s week of action from 8-14 February against the Government's damaging Trade Union Bill. “Five days a week, eight hours a day, trade union rates and holiday pay”. This was the chant of workers in the 1930’s demanding better working conditions – and the trade unions won them too. Unions have since won us maternity pay, sick pay and many other rights at work that we take for granted. Yet all of this is under threat. UK trade unions are already the most heavily regulated in Western Europe. The Trade Union Bill is a blatant attempt to make it harder for workers to stand up for their rights, for safety at work, or to defend their jobs and pay. Heartunions is a fantastic opportunity to tell people how important trade unions are and what they do both in the workplace and the community. By the end of the week it is anticipated that even more working people will have fallen in love with trade unions and become a member! 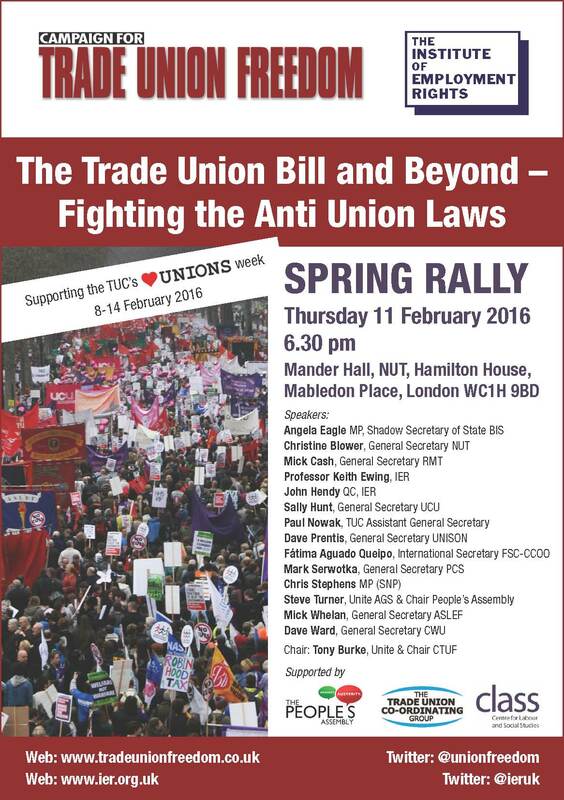 We’ll be at the (free) Trade Union Spring Rally in London on 11 February at NUT HQ from 6:30pm, but there are hundreds of other events taking place across the UK. Get involved. Join a union!